CS-20 Super Economy Stall provides maximum comfort and greater freedom. They are constructed of our 1 5/8" 10 gauge triple coated galvanized steel with rigid polyethylene rust shields on all pipes that are cemented in. There is also a 20" solid shaft in triple bend divider. Note: Solid shaft in front post is optional. Economy Comfort Stalls include 4' top rail, top rail clamp, stall chain with push in snap, stall chain clamp, and 20" solid shaft in triple bend divider. CS-20-D Economy Comfort Stalls come complete with double bend divider. 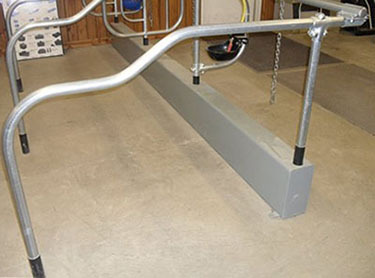 Includes 4' top rail, top rail clamp, stall chain with push in snap, stall chain clamp, and 4" column clamp.